Whether it’s an ancient Spanish Proverb, or a modern day nutritionist, we all know we need to take care of our bodies. Some more than others. I’ve always felt I was on the above average side in eating a healthy diet. (Not counting during college and the years immediately following when I lived on popcorn and ICEE’s from the gas station). But I don’t eat meat, only fish, lots of vegetables, whole grains, healthy fats, very little dairy, NO cheese, and MODERATION is my key. Any time I tell myself I can NOT eat something I love, like fried foods or chocolate chip cookies, I become COMPLETELY OBSESSED with them, and end up binging. So the thing that works for me is move more, eat less. I don’t deny myself anything, I just don’t eat much of the things I know aren’t the best for me. Now, according to more and more people, my diet is killing me. They start talking about leptin and metabolic syndrome and my head starts spinning. I have spent a lot of time online and talking to my very smart friends who are eating this way. I would have no problem giving up dairy. I pretty much already have, but even if I could give up whole grain bread, I still can’t wrap my head around the no farro, brown rice, quinoa, and even legumes. NO BLACK BEANS? NO CHICKPEAS? NO GREEN PEAS? But the scientific community has, for the most part, stayed on the fence. For now, I’m going to keep reading everything I can about the science behind the whole Paleo/ancestral diet thing, continue listening to my very smart friends, but continue eating whole grains and legumes in moderation. But when I get invited to my very smart Paleo-eating friend’s house for dinner and am asked to bring an appetizer and a salad, I have to get more creative. Those who have been eating this way for a long time have no problem coming up with ideas, but other than meat and vegetables, I wasn’t sure what to take. 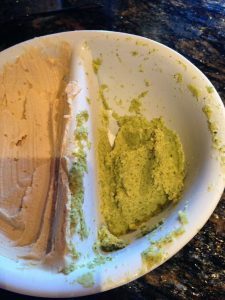 My dear husband can’t live without chips and hummus, but since those were out of the question, I made a yummy Cauliflower Hummus (completely paleo…no legumes at all), and for me I made my favorite Broccoli Hummus. That does include some chickpeas, but not many, and it was a huge hit, even with my friends. I tinkered around with a couple of old recipes and they were so successful I wanted to write them down so I wouldn’t forget. The problem is, I was so busy playing around and taste-testing that I forgot to take photos. The only photo I have is the bowl of leftovers…(regular hummus for J, and broccoli hummus). You can see which was more popular! There was basically none of the Cauliflower Puree left, other than a few bites that I ate by the spoonful the next day. So here are the recipes. I served with a ton of crudite’, and a few gluten-free crackers for J and I. Easy peasy. Separate the cauliflower into florets, cutting away the center core. Steam or microwave until very tender. While that is cooling, mince the garlic in a food processor. Add the olive oil, nut butter, spices and lemon juice and puree well. Add the cauliflower and puree until it is smooth. Add more olive oil if needed to get the texture smooth. Place in dish and drizzle with olive oil and sprinkle with more paprika and serve with veggies. 1. Steam the broccoli for five minutes until tender, but still bright. Refresh with cold water and drain on paper towels. (Very IMPORTANT…don’t overcook or the color will be a muddy green). 2. Turn on the food processor and drop in the garlic. Scrape down and puree again. Scrape down. 3. Turn on the machine and slowly pour in the lemon juice and oil with the machine running. Process until smooth. 4. Add the tahini and salt to taste. Blend well. Serve with veggies, and/or pita. Helpful links about paleo, and a couple refuting it, so you can be as confused as I am! !